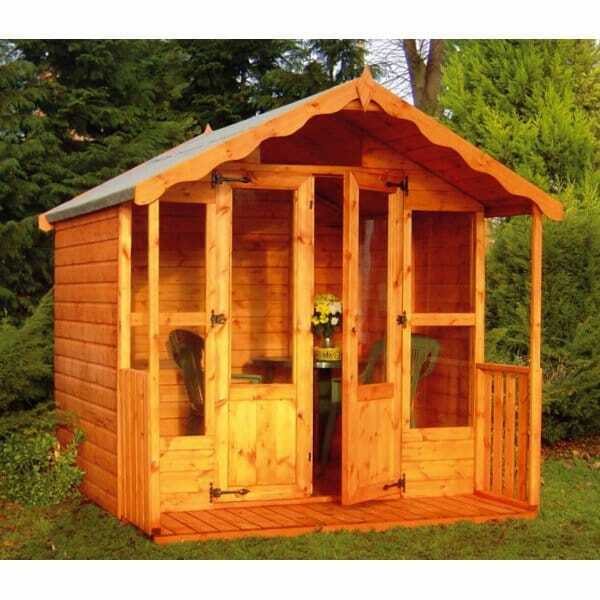 A1 Fernwood Summerhouse 7 x7 / 8 x 7: The A1 Fernwood Summerhouse is a lovely traditional summerhouse constructed from top quality Swedish pine. This building comes with clear glass glazing which allows for plenty of natural light and also ensures a great view of your garden. This well presented garden building comes in two sizes to suit your lifestyle needs, and the included veranda makes for a great place to sit out in the warm summer evenings. The double doors open outwards and are fitted with black fixings that add to the traditional look and feel of the whole summerhouse. The building comes supplied with roof felt or you can select the heavy duty roof felt instead. A wonderful building to add to your garden or outdoor space, fantastic value and quality from Garden Chic.